Alcatel does not believe in money for quality – for the sole reason that everyone deserves a good phone. 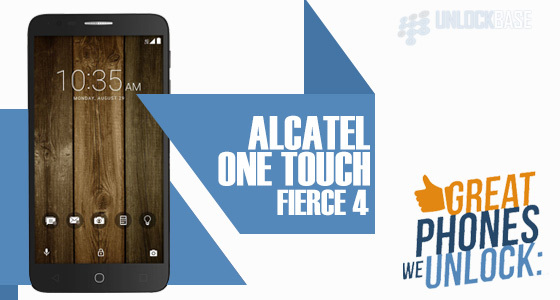 This is why Alcatel OneTouch Fierce 4 has been designed. It is a perfect fit for the users’ everyday tasks, giving them good battery life and definitely. Certainly, this phone is one you should go for. Purposely big in size, Alcatel OneTouch Fierce 4 aims to provide a beautiful viewing experience with its 5.5-inch HD IPS display carrying a 720p resolution. In great consideration for its users, Alcatel designed the unit with utmost simplicity. Its undeniably sleek design which appears with chrome trims and aluminum-brushed back panel perfectly displays a premium look and feel to the handset. Also, the phone gives users a comfortable hold to the phone as it only weighs 5 ounces and measures to 5.94 by 3.03 by 0.32 inches overall; slim enough to slide into a user’s pocket. Notably, the power and volume buttons also come off as slim – perfectly blending with the phone’s overall design. Alcatel OneTouch Fierce 4 offers its users an auto-focus 8MP rear camera that takes well-lit outdoor shots, and a good 5MP front camera for selfies. Moreover, it allows users to take gorgeous HDR and panoramic shots from a shortcut key on the lock screen for quick access, and similar to most phones today, it also has a Beauty Mode setting that users can use to take gorgeous selfies through its front camera. For video recording, the handset can provide a good 720 at 30fps quality shoot. With regards to connectivity, Alcatel’s handset boasts a 4G LTE connectivity that’s good for an everyday casual use at an affordable price. Aside from its blazing fast LTE connectivity, it also has good connectivity protocols such as Bluetooth 4.1, Wi-Fi 802.11, and an A-GPS that provides good sharing connection and an improved startup performance. Impressively, Alcatel OneTouch Fierce 4 is powered with a quad-core 1.1GHz CPU and a Qualcomm Snapdragon 210 chipset allowing basic tasks to run smoothly, and occasional games to be played. Additionally, the phone boasts a 2500mAh battery that’s perfect for a casual everyday usage. Pre-installed with an Android 6.0 Marshmallow, this Alcatel handset provides a clean set of app icons, a convenient drop-down menu comprising common settings such as the Bluetooth, Wi-Fi, and brightness adjustment, and a lot of customization options completing the phone’s essentials. It also comes with a built-in 16GB internal storage running on 2GB RAM, and a MicroSD slot that supports 32GB additional storage allowing users to enjoy the phone at its best. Taking pride in its key features, Alcatel OneTouch Fierce 4 allows users to enjoy entertainment on-the-go with its bright 5.5-inch HD IPS display and crystal-clear audio, undeniably perfect for watching movies while on a trip or chilling at home. Additionally, it provides users an enhanced message sending with special text formatting, graphics, animations, and ringtones, and easy access video calling that is convenient for everyday communication without installing extra apps. With all the good points that the Alcatel OneTouch Fierce 4 can offer its users, it wouldn’t be as much useful without a good service provider. So what better way to solve this problem than to get help from UnlockBase – the best web unlocking service with the widest range of smartphone brands and units to unlock! The process will be easy as 1,2,3; just request and apply through the Device Unlock APP and it’ll be possible in your phone, no need for external communications – try it now!